Visible (VIS) satellite imagery and infrared (IR) imagery have different ways of detecting clouds. Visible imagery is produced by the sun's rays reflecting off of clouds. Infrared is produced by sensing the emitted radiation coming off of clouds. The temperature of the cloud will determine the wavelength of radiation emitted from the cloud. Some advantages of visible imagery is that it has a higher resolution, shows cloud texture better, and can be used to get a good idea of the thickness of the cloud. Some advantages of infrared imagery is that is can be used day and night, it can be used to determine the temperature of cloud tops and earth surface features, and it can be used to get a general idea of how high clouds are. Below are on example of a visible image and an infrared image. Below the images I will discuss characteristics that can be determined from the images and satellite images in general. Notice the visible image has a higher resolution of the clouds. On visible it is easier to see the individual cloud elements. There is more texture on visible also. In general you will be able to see vertical development on visible better than on infrared imagery. Brighter white on visible represents thicker cloud. Where there is no cloud you can see the land surface. On visible it is also easier to see land features. Notice the Mississippi River Delta and the tributary river systems flowing into the Mississippi River on the visible image. Since different land surfaces have a different amount of reflection (different albedo), areas with more reflection will show whiter and less reflection will be darker. On infrared the whiter land surfaces are colder and the darker land surfaces are relatively warmer. This applies to clouds also which will be discussed next. A cloud that is very white of infrared imagery is a cloud that is very cold. Since temperature tends to decrease with height in the troposphere, upper level clouds will be very white while clouds closer to the surface will not be as white. If the clouds near the surface are the same temperature as the land surface it can be difficult to distinguish the clouds from land. In the example infrared image above the clouds are much whiter than the land. From this we know the clouds are colder than the land. Since the clouds are not bright white though this suggest these clouds are low and middle level clouds and not high clouds. The lumpy appearance of the clouds on visible suggests the clouds are cumulus and stratocumulus type. Since the clouds are not wispy and not very bright white like thunderstorm clouds, this suggests the clouds are not very thick and are thus within the low and middle levels of the troposphere. Below are some general rules to determine cloud characteristics when comparing visible and infrared satellite images. 1. If the cloud is bright white on infrared then it is a high cloud or has a cloud top that is developed high into the troposphere. 2. If a cloud is bright white on visible but is not bright on infrared then it is likely this is a cloud that is close to the earth's surface. This can happen when there is a thick layer of fog or stratus near the surface. 3. If cloud is seen on visible but very hard to see on infrared then it could be a layer of fog or shallow stratus near the surface. 4. Thunderstorms will show bright white on both visible and infrared. 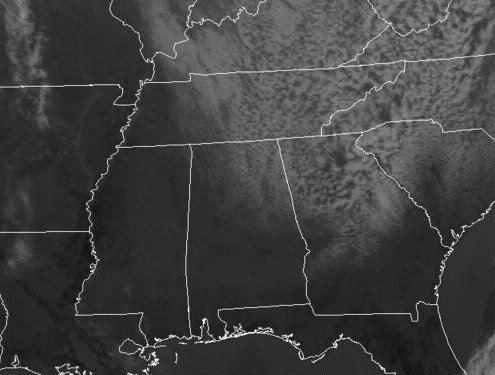 A thick cloud will be bright white on visible and cold cloud tops will show bright white on infrared. Look for other features also to make sure it is a thunderstorm such as anvil blowoff, overshooting top and extremely textured on visible imagery. 5. If a cloud is not very white on visible then it is likely a thin cloud. If a cloud is not very white on infrared then it is likely a cloud near the surface or it is a very thin cloud. 6. 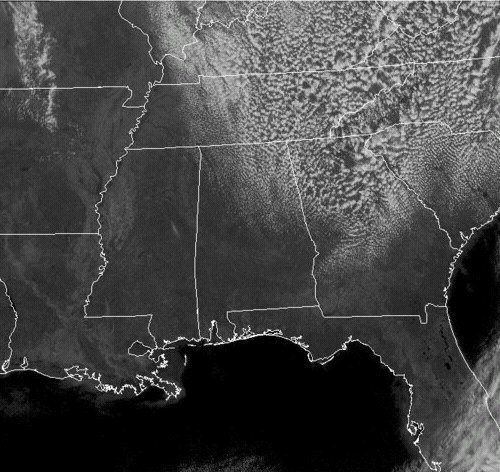 When the sun is close to setting, clouds will not show up as white on visible imagery due to less reflection. 7. Wispy looking clouds on visible that are very white on infrared are likely high level clouds such as cirrus or anvil blowoff. 8. Cumulus clouds have a lumpy texture. Stratus clouds have a flat texture especially on infrared. Cirrus clouds tend to be thin and show up white on infrared. Below is a direct comparison between a VIS and IR image with some important notes about the comparison. 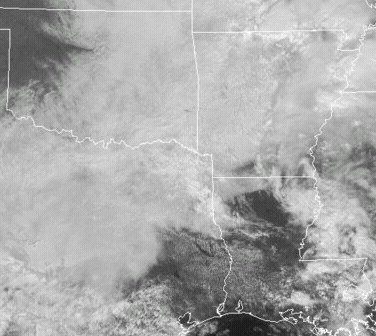 Notice much of the cloud is bright white on VIS in Texas but a much darker shade on IR. This indicates low clouds. There are thunderstorms in eastern Tennessee. 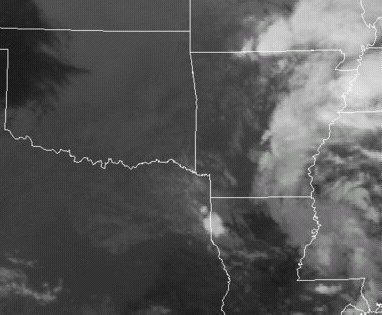 Notice those cloud areas are bright white on both VIS and IR. There is light rain falling in western Mississippi. These clouds are not as white as the thunderstorm clouds but are more white than the low clouds in much of Texas on IR.